The eagle-eyed among you will notice that this cover image is unusual. 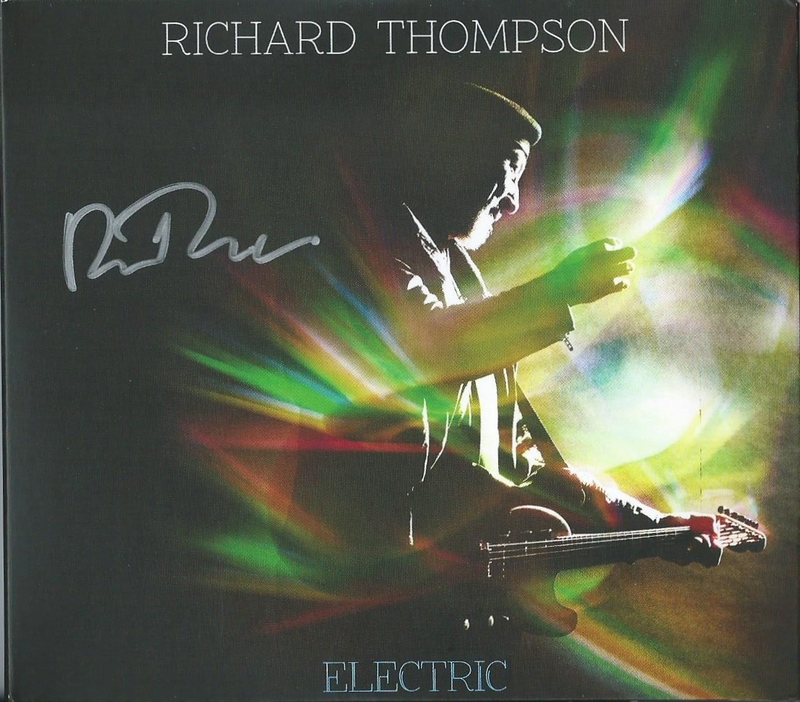 Rather than purchasing it from a usual e-tailer, I pre-ordered the 2cd version of this title from Proper Records and managed to get a copy autographed by the excellent Richard Thompson himself. Now, I have to confess that I’ve been a big-time fan of RT since ‘I Want To See The Bright Light Tonight’ back in 1974. In fact I’ve got pretty much everything of his that’s been issued! Even so, I’ve found that I don’t listen to the more recent material all the way through very often. Sure, there are brilliant individual tracks but I’ve found myself skipping around rather than listening to a whole collection for the last few releases. ‘Electric’ however, is a blistering return to form with wonderful guitar work and singing and eighteen cracking song/tunes. Produced by Buddy Miller, the core trio (which toured the UK in 2013) was RT, Taras Prodanuik on bass and Michael Jerome on drums. Notable among the guests is Alison Krauss on harmony vocals (a bit under-used I thought). Richard Thompson is such a brilliant – and distinctive guitarist (both electric and acoustic) and it’s a pleasure to crank up the volume on some of these tracks and hear him rocking out (try ‘Will You Dance, Charlie Boy’ from the bonus disc).